1) Square Pedestals: Our bestselling pedestals, suitable for displaying a range of artwork and retail products, up to a maximum weight of 150kg. 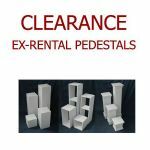 The pedestals have a 30x30cm square base, with heights from 30cm to 120cm. 2) Hollow Pedestals: Suitable for displaying lighter artworks or products. The hollow pedestals have a 30x30cm square base, with heights from 30cm to 120cm. Note the 90cm and 120cm height pedestals come with an internal shelf - handy for displaying extra items. These hollow pedestals are especially popular for displaying flowers and sculptures. 3) Square Plinths: Featuring a decorative architrave top and bottom, the plinths are suitable for displaying a range of artwork and retail products, up to a maximum weight of 150kg. The plinths have a 30x30cm square base, with heights from 30cm to 120cm. These wooden plinths are especially popular for homes, weddings and exhibitions. 4) Russian Doll Pedestals: Our unique set of 4 'Russian Doll' pedestals are ideal for saving space when transporting the pedestals around or when storing the pedestals. Each of the 4 pedestals cleverly fits inside the other, especially popular for use at events and exhibitions. WHY CHOOSE OUR PLINTHS & PEDESTALS? We supply the latest contemporary plinths & pedestals, all designed and handmade here in the UK. Our plinths & pedestals are finished to a museum quality, using 3 coats of paint. Primed, undercoated and finally top coated in acrylic brilliant eggshell white (other colours available). All our plinths & pedestals are made from 12mm Medium Density Fibreboard, moisture resistant, and bonded together under pressure using modern adhesives. With precision mitered joints on all sides, this forms a strong seamless structure, capable of supporting up to 150kg. Our plinths & pedestals can easily be touched-up or repainted, if required. This helps keep the finish of the plinths & pedestals in pristine condition, in case you mark them when moving around for your events/exhibitions etc. We also offer a bespoke service to produce made-to-measure plinths & pedestals. Please contact us with your needs and we will send you a quote. Our sister company, GingerWhite, has years of experience displaying artwork in the UK. We are so confident in the quality of our plinths & pedestals, that we offer a no-quibble 10 day returns policy for all of our plinths & pedestals.